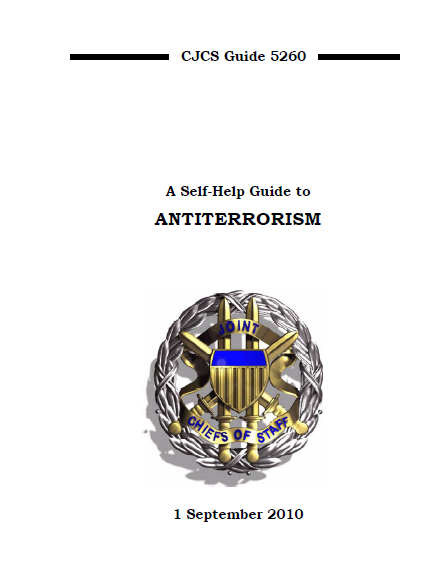 This guide is designed to assist in making you and your family less vulnerable to terrorists. You should review its contents and incorporate protective measures applicable to your particular situation. It is important that you ensure all members of your family are made aware ofthis valuable information so they not only protect themselves, but also become an integral part of the overall community force protection effort. Terrorists generate fear through intimidation, coercion, and acts of violence such as bombings, hijackings, or kidnappings. As recent events have shown, terrorists have reached new levels of organization, sophistication, and violence, often targeting members of the Department of Defense and their families. Their tactics and techniques are also continually changing and will continue to be a challenge to predict and neutralize. Accordingly, we must remain vigilant. You and your family are a vital, yet vulnerable military resource. Use of this guide and these proven security habits will not ensure immunity from terrorist attacks but should reduce the possibility of becoming a target. Defensive awareness and personal security are responsibilities of everyone assigned to the Department of Defense. Your overall awareness will not only help to protect your family but will also increase the security of all members of the military family. Keep a low profile. Your dress, conduct, and mannerisms should not attract attention. Make an effort to blend into the local environment. Avoid publicity and do not go out in large groups. Stay away from civil disturbances and demonstrations. Be unpredictable. Vary daily routines, such as your route to and from work and the time you leave and return home. Vary the way you dress. Do not exercise at the same time and place each day. Never exercise alone, on deserted streets or country roads. Let people close to you know where you are going, what you will be doing, and when you should be back. Be alert for anything suspicious or out of place. Do not give personal information over the telephone. If you think you are being followed, go to a pre-selected secure area such as a military base or police station. Immediately report the incident to the military police, security forces, or law enforcement agencies. In overseas areas without such agencies, report suspicious incidents to the security officer or the military attaché at the U.S. Embassy. Instruct your family and associates not to provide strangers with information about you or your family. Avoid giving unnecessary personal details to anyone unless his or her identity can be verified. Report all suspicious persons loitering near your office or in unauthorized areas. Attempt to provide a complete description of the person and/or vehicle to police or security personnel. Consider taking a photograph of the person if it can be done discreetly. Advise associates or family members of your destination and anticipated time of arrival when leaving the office or home. Do not open doors to strangers and report unsolicited contacts to authorities. Refuse to meet with strangers outside your work place. Pre-program cell phones or memorize key phone numbers — office, home, police, security, etc. Be cautious about giving out information regarding family travel plans or security measures and procedures. Do not leave your car on the street overnight, if possible. Park your car in well-lighted areas. Leave only the ignition key with parking attendant, not residential keys. Do not leave garage doors open or unlocked. Taken Hostage — You Can Survive! Analyze the problem so as not to aggravate the situation. Make decisions to keep the situation from worsening. Maintain discipline to remain on the best terms with the captors. Have your family affairs in order, including a current will, appropriate powers of attorney, and measures taken to ensure family financial security. Issues such as continuing the children’s education, family relocation, and disposition of property should be discussed with family members. Your family should know that talking about your official affiliation to non-DOD people may place you, or them, in great danger. Family members should consult with the local public affairs office prior to talking with media or answering any questions.